Enclosure or Inclosure is the term used to describe the consolidation or extension of land-holdings and generally it was applied to large areas which had been used communally, dividing it into fields farmed by individuals, or to waste such as marsh or moorland to be improved and brought into agricultural use. Large communal pastures were broken up and enclosed, and the strips of land which had been farmed under the open field system, were consolidated into small fields. Many early enclosures of common lands and pastures were made by general agreement and from the 16th Century onwards, Private Enclosure Acts had to be passed by Parliament, but these became so frequent that in 1801 the first General Enclosure Act was passed to streamline the process. A further Act in 1845 appointed permanent Enclosure Commissioners who were authorised to issue Enclosure Awards without submitting them for Parliamentary approval. These Commissioners allocated plots which they considered to be a fair equivalent "in full and perfect satisfaction" of the pre-existing open lands and common rights. Their decisions were recorded in the Enclosure Award documents and were accompanied by a map prepared by an appointed surveyor. The Acts were used to enclose almost 7 million acres of land, 21% of England was enclosed by over 5000 Acts of Parliament. Around two thirds of this land had been arable and the rest was common or waste. However as late as 1760, Malham village still had fields farmed in strips as they had been in the medieval period. 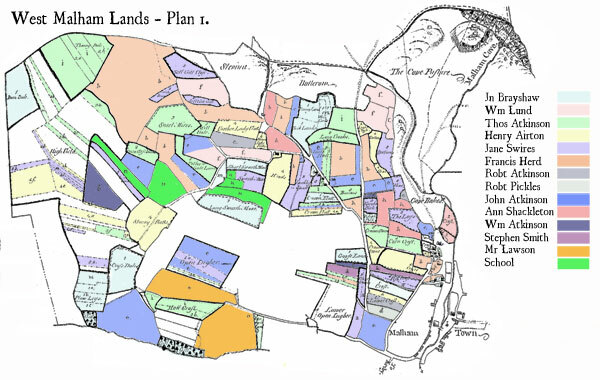 This can be seen in the plan below, which shows the tenanted land held in West Malham by Thomas Lister in 1760, much of it still divided into strips. Henry Airton's 24 acres was actually made up of 24 parcels of land, only seven were over an acre, the being largest 4a 1r 16p and most were less tha 3 roods, with the smallest being just 14 perches/poles ( just over a third of an acre). By the 19th century, with the exception of some upland stinted pasture areas, most of the land in Malhamdale had already been enclosed "by agreement", Private or Parliamentary Act. In consequence the existing awards deal with a relatively small part of each township. There is a National Archives Enclosure Awards Research Guide and the existing Awards for Malhamdale can be found at the North Yorkshire County Record Office, Northallerton. East and West Malham stinted Pastures in the township of Malham, 2,758 acres. Kirkby Grain & Kirkby Cow Close stinted pastures, 566 acres. Common fields and stinted pastures, including Scosthrop High and Low Moors 743 acres. Highside Pasture situate in the township of Airton. Winterburn Moor in the parish of Gargrave, 223 acres. Two stinted pastures called Hetton Moor otherwise Hetton Cow Close, 733 acres and Hetton Ox Pasture, 316 acres. To all to whom these presents shall come I Ralph Lodge of Bishopdale in the Parish of Aysgarth in the County of York Land Agent send greeting. And Whereas all such objections as have been made to my said Report having been heard and all such inquiries having been made in relation thereto as the said Inclosure Commissioners have thought fit the said Inclosure Commissioners have authorised and directed me to cause to be drawn up and engrossed on Parchment my Award in the matter of such Inclosure. One private Carriage and Occupation road of the width of nine feet to be called the “Kirkby Malham School” and the “Kirkby Malham Overseers Road” commencing at and branching off from the said Malham and Langcliffe Road at the place marked F on the said Map and extending in a Southwestwardly direction over a portion of the Allotments numbered 6 and 10 on the said Map to and into the allotment numbered 12 on the said Map and terminating at the place marked EE on the said Map for the use of the Owners and occupiers for the time being of the said allotments numbered 10 and 12. And I direct and appoint that the said last mentioned private carriage and occupation Road shall for ever hereafter be maintained and repaired by the Owners and proprietors for the time being of the allotments numbered 15 and 14 on the said Map in the following proportions viz: Six hundred yards at the east end thereof by the owner and proprietor of the said Allotment numbered 14 and the remainder at the west end thereof by the owner and proprietor of the said allotment numbered 15. One other private Carriage and Occupation road of the width of fifteen feet to be called the “Sellgill Road” commencing at the place marked Z on the said Map and extending in a South westwardly direction over a portion of the allotments numbered 29 and 26 on the said Map to and into two certain ancient Inclosures called Sellgills marked CC and DD on the said Map for the use of the owners and occupiers for the time being of the said ancient Inclosures called Sellgills. And I direct and appoint that the said last mentioned Private Carriage and Occupation road shall for ever hereafter be maintained and repaired by the Owner and Proprietor for the time being of the Allotment numbered 29 on the said Map. One other private Carriage and Occupation road of the width of fifteen feet to be called “Lord Ribblesdale’s Road” commencing at and branching off from the said Cove Road at the place marked S on the said Map and then branching and extending in a North Eastwardly direction across the stream to and terminating at an ancient Gate leading to an ancient Inclosure called the Cove Close marked T on the said Map for the use of the Owner and occupier for the time being of the said ancient Inclosure called Cove Close. One other private Carriage and Occupation road of the width of fifteen feet to be called “Betty Lunds Road” commencing at and branching off from the said Cove Road at the place marked U on the said Map and then branching and extending in a North Eastwardly direction across the Stream to and into certain ancient Inclosures called Cove Bottom and Cove Wood marked V on the said Map for the use of the Owners and occupiers for the time being of the said ancient Inclosures called Cove Bottom and Cove Wood. And I direct and appoint that the said last mentioned private Carriage and Occupation road shall for ever hereafter be maintained and repaired by the owner and proprietor for the time being of the said field called Cove bottom. And I direct and appoint that the said last mentioned Private Carriage and Occupation Road shall for ever hereafter be maintained and repaired by the Owner and Proprietor for the time being of the said field called West Cote Land only. One other Spring called “Cove head Spring” rising and situate in the allotment numbered 32 on the said Map to be conveyed by a Drain or piping into and through a portion of the said allotment numbered 32 to and into the Allotment numbered 22 and from thence to and into the allotments numbered 6 and 8 on the said Map situate in East Malham for the use of the Owners and Occupiers for the time being of the said Allotments respectively. And I direct and appoint that the owners and proprietors for the time being shall at all times hereafter have free access to repair the said Drain or Piping as laid down in the said portions of Allotments. One public footway of the width of three feet to be called the Malham or Trow Gate foot way commencing at and branching off from the said Lings Road at the place marked O on the said Map and extending in a Northwardly direction into and over a portion of the allotments numbered 8, 6, 5, 4 and 1 to an ancient Stile called “Lings Head Stile” marked P on the said Map. 660 Yards in length commencing at the North west corner thereof and running in a Southern direction Also the whole of the fence on the East side thereof against the Allotments numbered 10 and 12 and the whole of the fence on the North side thereof against an ancient Pasture called Outside. All the fence on the East side thereof against the Allotment numbered 15 except 335 Yards at the North end thereof hereinafter directed to be made and repaired by the Owner and proprietor of the Allotment numbered 15. Also all the ancient fences on the west side thereof against Kirkby Fell and an ancient Inclosure belonging to Betty Lund And the whole of the ancient fence on the North side thereof against the allotment Numbered 12. 335 Yards in length commencing at the North West corner thereof and running in a Southern direction against the Allotment numbered 14 and all the ancient fences on the North and East sides thereof against the Allotments numbered 12, 17, 23 and 25. All the fence on the North side thereof against the allotment numbered 18. and all the fence at the East end thereof against the Malham and Langcliffe Road. All the fence on the East side thereof against the allotment numbered 5 except 660 yards of the North end thereof hereinbefore directed to be made and repaired by the Owner and proprietor of the Allotment numbered 5. also all the ancient fence on the West Side thereof against Stockdale Estate and all the ancient fence at the North end thereof against Outside Pasture. All the fence on the North East side and North West end thereof against the Malham and Langcliffe Road and the Allotment numbered 43. All the fence on the West and South sides thereof against the Malham and Langcliffe Road and the Allotment numbered 30. and all the Ancient fence at the South east corner against the Allotment numbered 34. All the fence on the South side thereof against the Allotment numbered 26. All the fence on the North side thereof against the Allotment numbered 5. All the fence on the North East and North West sides thereof against the Allotment numbered 8. All the fence on the West, East and North East sides thereof against the Allotments numbered 10. 15. and 18. All the fence on the west side thereof against the Grassington Road to be repaired only in future. And I the said Ralph Lodge do hereby order direct and appoint that the several walls for inclosing the several allotments hereinbefore described not already set up and made, shall be raised, set up and made respectively within the space of two years from the confirmation by the said Inclosure Commissioners of my award by the several persons owners for the time being of the said several allotments on the sides hereinbefore in that behalf prescribed, on which sides respectively a T is marked or drawn thus fence on the said Map. And I further order and direct that the several Allotments shall be fenced with a good and sufficient wall fence and that the stake shall be the centre of all the Fences. Map accompanying the Malham Inclosure Award - Use the zoom, pan and grab controls to view the map. Part 1 : West Malham Moors, showing the lead mines and mill. Part 2 : East Malham Moors, showing Carr Scar. Part 3 : East MalhamMoors showing Gordale Scar.